In 1987, Piguet first released a remarkable chronograph, the ultra-thin, hand-wound caliber 1180. 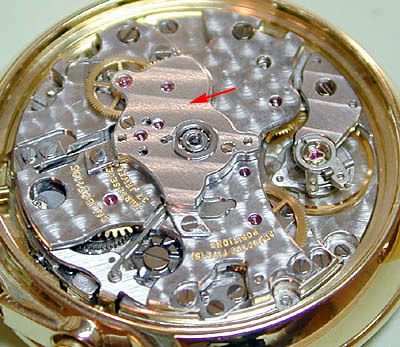 With a total height of only 3.95 millimeters, it was the thinnest chronograph caliber every produced. A classic column-wheel design with some very novel design twists, it was also the first new chronograph caliber in decades. It is remarkable that, at a time when most Swiss manufacturers had not yet quite realized that the mechanical watch was being reborn, Piguet and Blancpain made this significant investment. The 1180 was destined for an interesting future. The original 1180 is an 11.5 ligne (25.60 millimeters) design running at 21,600 beats per hour. The train runs in 29 jewels. (left). 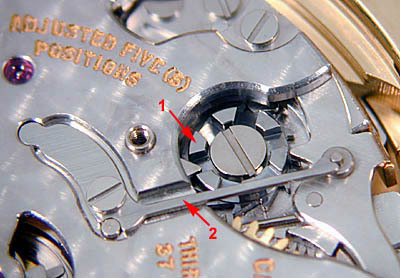 The automatic winding bridge is indicated at the arrow (central rotor removed). The 1185, despite the overlying central rotor, adds only 1.55 millimeters to the height of the 1180, for a total thickness of 5.5 millimeters. 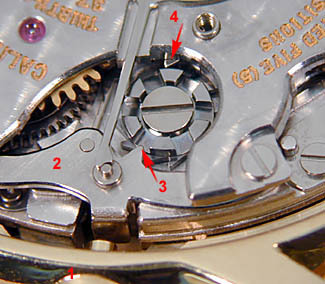 The automatic winding added a ball bearing for the rotor, as well as eight jewels, for a total of 37. Only a year later, Piguet introduced the remarkable caliber 1181. A hand-wound rattrapante (“split seconds”) design (left), the 1181 offered one of the most refined rattrapante mechanisms ever produced. Adding 1.4 millimeters to the height of the 1180, the 1181 also carries a single extra jewel, for a total of 30. The rattrapante bridge is indicated at the arrow. (left). This is, of course, the rattrapante automatic. The world’s first automatic rattrapante, the 1186 is a relatively thin 6.9 millimeters in height, is comprised of 361 discrete parts, and utilizes 38 jewels. To this day, these four movements, along with the addition of the recent F185, form the basis of Piguet’s chronograph offerings. 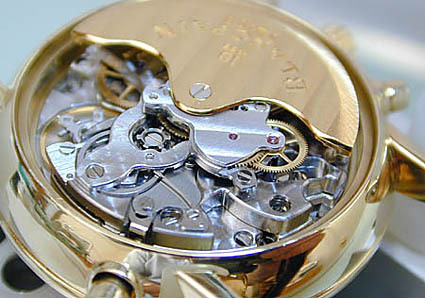 The caliber F185, a “flyback” version of the 1185, utilizes four more parts than the 1185, but the same jewel count (37). Like the 1185, it is 5.5 millimeters thick. All of the Piguet chronographs share the same basic movement introduced with the caliber 1180. 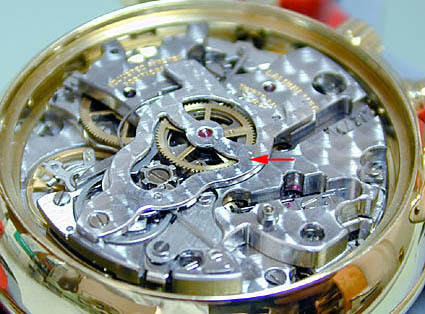 A fully integrated chronograph ebauche, the caliber uses some unusual construction, including a three-quarter bridge, removed in the photograph below right. 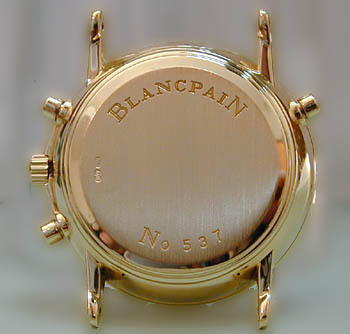 All wheel train and chronograph components are contained under this bridge, although some of the wheel train is actually accessible on the bottom plate of the movement. (10) the column or pillar wheel (which coordinates all switching functions). 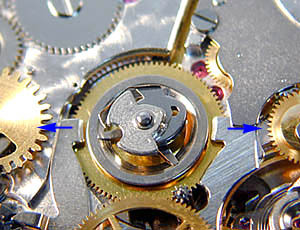 (3) that the column wheel has admitted the beak of the reset lever. At (4) the beak of the start lever is lifted by the pillar. The column wheel design provides smooth operation of the pushers as well as the most accurate coordination of start, stop, braking, and reset functions. With regard to the column wheel itself, the Piguet is a classic, very high-quality design. 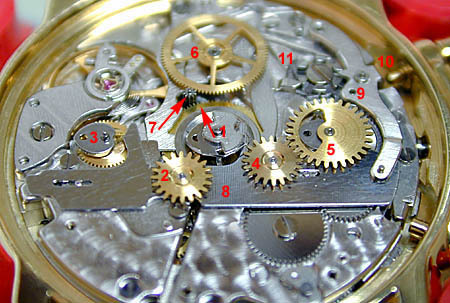 A chronograph is simply a way of displaying and totaling the movement of the fourth wheel for a desired increment of time. 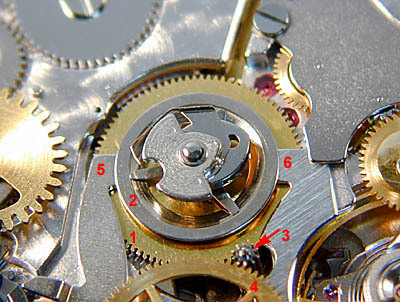 Because the fourth wheel rotates once per minute, the chronograph center (sweep) wheel is usually driven by the fourth wheel by means of an intermediate wheel that switches in and out of contact with the chronograph center wheel. 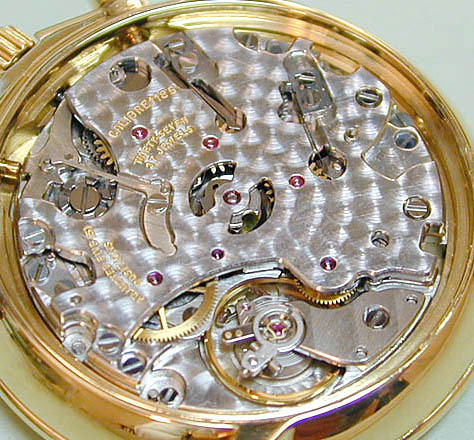 Despite this classic approach to chronograph design, Piguet developed a novel approach that offers several advantages. (5 and 6) simply lift the center wheel off an underlying clutch face attached to the pinion that carries the attached heart cam and center sweep hand. The clutch arms, themselves, also serve as brakes, assuring that stopping and braking functions are perfectly coordinated. 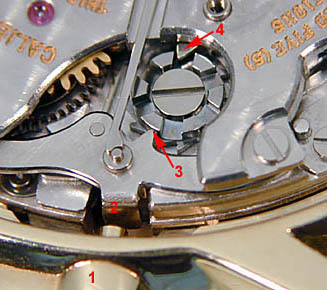 When the chronograph is started, the clutch arms lower the constantly rotating center wheel onto the pinion clutch face and the center hand and heart cam begin to rotate. Brake release is, again, accomplished by the clutch arms and is perfectly coordinated. One benefit of the clutch is that hand start and stop is smooth and accurate, with absolutely no visible jump. Because braking is accomplished by the clutch arms, the design is simplified and typical synchronization problems between start or stop and braking are eliminated. 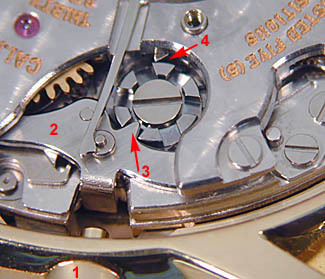 Finally, because the chronograph center wheel is always driven, there is little difference in load on the movement between a stopped and running chronograph section.